What happens #LondonMarathon where people don’t turn up? Ready for the Hillsborough to Anfield Run? My second race of the weekend wasn’t my race at all, it belonged to my daughter, ASK and I’ve never been more ecstatic not to be racing. 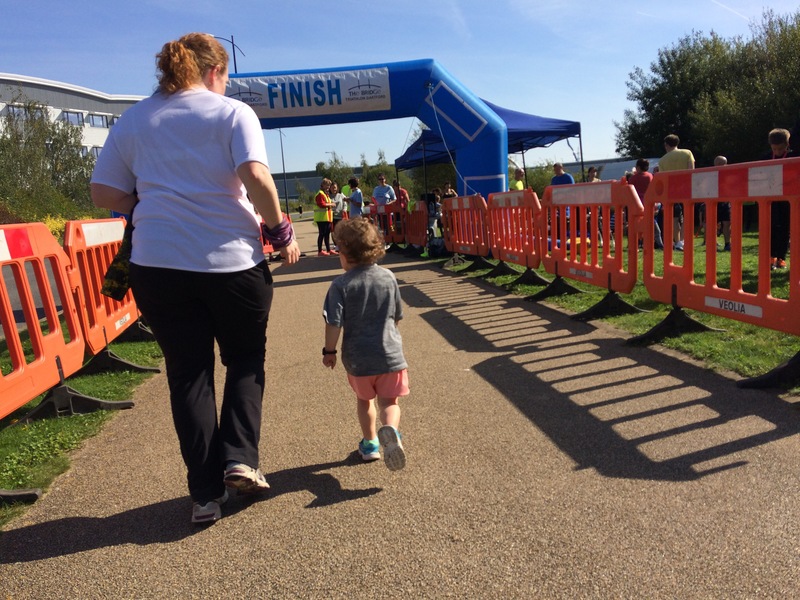 I remember when she was born, almost exactly three years ago that I decided I would enter a race with her and aged 15 days old she completed the Dartford Bridge 2km Fun Run with myself, the GingaNinja and Pops (my father). Well much has changed since that race, ASK has become a boisterous toddler, my father and I fell out over Hillsborough (although it was always made clear he was welcome at our door to see ASK whenever he wanted) and both the GingaNinja and I have lost half a yard of pace due mainly to Dominos Pizza. Anyway three years later we return to the scene of her first medal triumph, only this time she’s powered by her own legs. Now I’ve been accused by many of being a pushy parent getting her to run but the truth of the matter is she asked me to find her a race because, ‘I want another medal dad’. 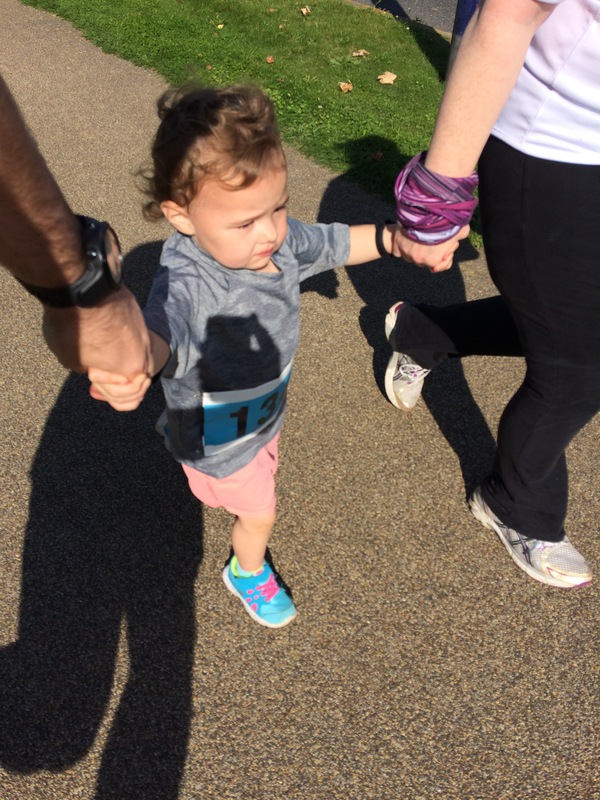 She also asks to go training and use both the running buggy and the Unirider – I think it’s fair to say she’s the pushy toddler and I’d rather be taking her running than having her sat infront of Dora the Explorer or Paw Patrol! Anyway we rocked up to the start line just after the 10km had started and we paid our £3 entry fee (which would be going to a local good cause) and waited for the main race runners to come in. ASK stood transfixed at the sides watching runners of all shapes and sizes crossing the finishing line and claiming their medals – desperate to know when she could get started! Before long it was time to line up – kids from near newborns to 13 and 14 year olds. We eyeballed a couple of our fellow toddlers that we knew we could take down and when the horn erupted we set off from our position at the back of the pack like lightning. ASK quickly set a steady if unspectacular pace for the first 500 metres, preferring to soak up some of the undeserved adulation she was receiving! But once out of sight of the supporters we made better time taking two other runners on the first corner, followed quickly by a slightly older girl whose interest seemed to have waned a little. By the time we had reached the end of the first kilometre we had taken out another couple of runners but the field had now spread itself out but with just 8 minutes on the clock we looked to be making good time and ASK showed no sign of stopping (other than for water breaks). In the distance – some 200metres ahead – we saw a couple of older boys, probably aged about 10 and we suggested to ASK that we could try and catch them. As they disappeared around the corner and into the final stretch she looked dejected that they had gotten away. ‘Do you want to catch them?’ we inquired. ‘Yes’ replied ASK and so with that we hit the go faster afterburners and our little daughter responded with much enthusiasm and although we would never catch the boys we knew that the sounds and sight of the finish line would give her a huge lift to finish well. With just a couple of hundred metres to go ASK geared up again and started hurtling towards the finish – the remainder of the crowds cheering her every last step home. Cruising through the barrier she stopped only briefly to grab a medal (we offered thanks in her behalf) and then some rehydration and refuelling – this had been a gruelling race. What can I say? There are a few things to say about the race, the organisers and ASK. 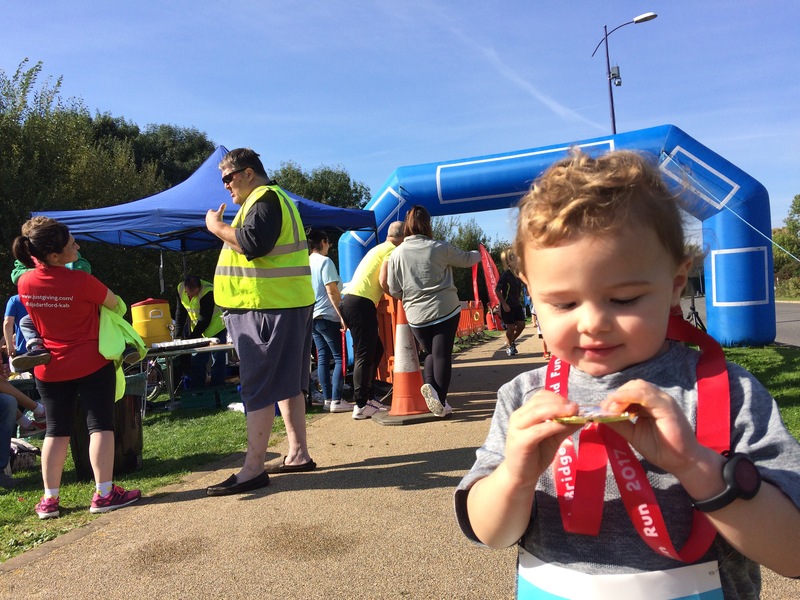 Firstly let me congratulate Bridge Triathlon events who year in, year out put on lovely events for all ages and all abilities. As a regular runner I’ve taken part in a few of the events as has the GingaNinja and ASK marks her third Bridge Triathlon event here. 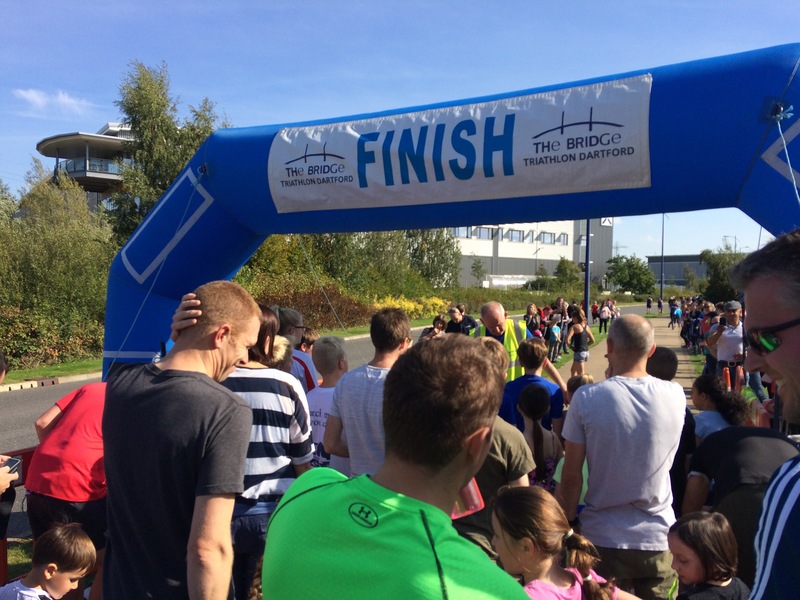 The Dartford Bridge 10km and the 2km fun run really help promote a healthy running lifestyle and it’s low key approach in a simple setting make this a perfect September Sunday morning event. Secondly the event itself is magnificent, either the 10km or the 2km (the only reason I wasn’t doing the 10km was because I’d ruined my groin at the RunWimbledon marathon the day before). The route is fast and flat and if you want it to be it’s a really good event for racing FAST! And finally, ASK (my UltraBaby) What can I say other than, well done little daughter of mine. She ran brilliantly, she ran fast and she wanted to do it and is already inquiring as to when she can get her next race medal. 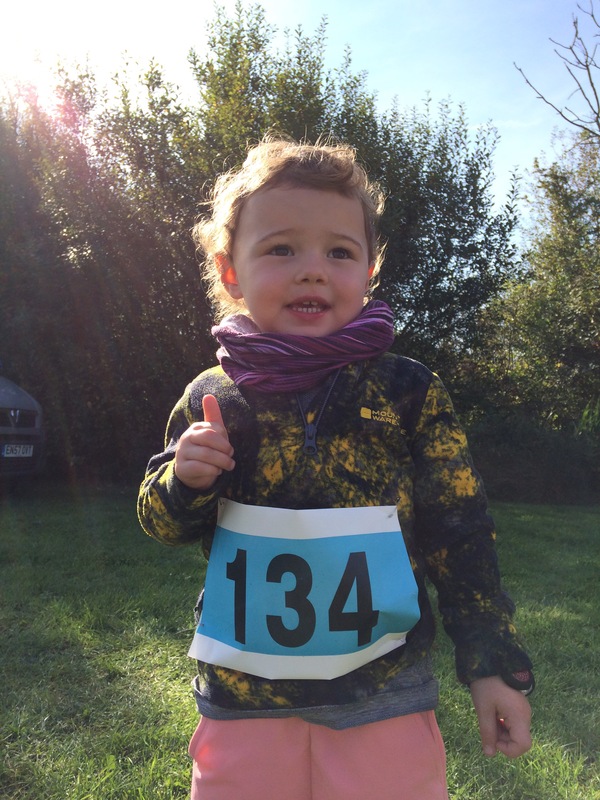 So if you know of an upcoming event please let me know – I’ve got a three year old ready to race and that’s an attitude I’m happy to encourage. I can't run fast so I choose to run far. After a short break of 23 years I have registered to run the Melbourne Marathon. Amateur wrangling with sewing machines, wool, fabric and thread. Some baking too! Taking it one run at a time.